Since the beginning months of USS Constitution‘s 2015-2017 dry docking and restoration project, we have taken the time at the turn of each new year to review the past year’s work and to look ahead to coming projects. 2017 was momentous in the ship’s restoration as it saw the final days of “Old Ironsides” in the Charlestown Navy Yard’s Dry Dock 1 and her re-floating in late July. To celebrate the success of the completion of Constitution‘s eighth dry docking (since 1927) and the skills and talents of the Naval History & Heritage Command Detachment Boston ship restorers and riggers who have worked so diligently on the ship, let’s review the highlights of the 2017 work. USS Constitution’s port and starboard after quarters are built with glassed-in galleries that served several functions — the most important being as the location of the “heads” (toilets) for the captain and commodore (should both officers be assigned to the ship on a voyage). Both quarter galleries were extensively re-built, beginning in 2016, with the exterior work being finished by mid-summer, 2017. By the time that autumn 2017 arrived, each gallery had new lower sills, exterior planking, fashion pieces, rafters and roofs, interior finish work, and windows. Although the eagle had been removed several times in the later decades of the 20th century for repairs to itself and the stern, the inscription had never been noted. Now we know that the “Eagle of the Sea” – Constitution – has a (now) 101 year-old expertly carved eagle on her stern. Thereby eliminating 430 pounds from hanging below the bowsprit. Up-rigging on “Old Ironsides” continued throughout the summer and into the early autumn of 2017. Once the topmasts were installed, the shrouds (the vertical standing rigging) for those masts was rigged and then the repetitious process of “rattling down” began. USS Constitution‘s bow has been variously decorated over the past two-plus centuries with different figureheads and billetheads. For the 2015 restoration, the cutwater’s decoration, the trailboards, had to replaced after seeing 85 years of service. The new trailboards are carved from mahogany and mounted on Douglas fir backing boards. Josh Ratty, NHHC Detachment Boston ship restorer had the task of carving the new boards using a GEMINI™ Universal Carving Duplicator machine. One-hundred new hull planks were replaced on Constitution during the 2015-2017 dry dock period, most above the waterline. The cast iron hawse pipes, found in the ship’s bows, had to be removed for the planking work. The re-installation of the pipes involved aligning and adjusting the pipes, the exterior and interior flanges, and manufacturing new pipe bolts. In the weeks leading up to USS Constitution‘s July 23, 2017, un-docking, final touches were put onto the ship including new drafts numbers on the bow and stern, fenders along the port and starboard waterlines, hull painting, and re-furbished long-gun carriages. Twenty-six months went by very quickly and the day of un-docking arrived for USS Constitution, her crew, and the Naval History & Heritage Command Detachment Boston. The re-floating of the ship from the dock had to be executed at the extreme high tide was just cresting in Boston Harbor, necessitating a late night for all involved. The filling of Dry Dock 1 began at 4:05 p.m. on the 23rd, and Constitution lifted off her keel blocks around 9:50 p.m. At 10:45 p.m. the caisson (which had had its ballast water pumped out) was removed from the sill of the dock and at 11:00 p.m. the NHHC Detachment Boston’s beaver boat picked up the out-haul line attached to Constitution‘s stern bridle and began slowly tugging the ship from the dry dock. The projects for the 2015-2017 restoration did not end when USS Constitution was re-floated. Throughout the summer and autumn of 2017, various tasks were accomplished, all with the goal of making “Old Ironsides” look more like the victorious sailing warship that she was. After spending several weeks at the Charlestown Navy Yard’s Pier 1 East, where Constitution‘s hull planks below the waterline were allowed to swell up, she and USS Cassin Young were moved back to usual pier locations. Constitution to Pier 1 West and Cassin Young to Pier 1 East. USS Constitution‘s replica 32-pound carronades and 24-pound long guns were installed in early August, 2017. To wrap up 2017, which was such an eventful year for “Old Ironsides”, the ship, her crew, the NHHC Detachment Boston staff, and guests commemorated Constitution‘s 220th anniversary with her first underway cruise in three years. Thousands of spectators gathered along the waterfront to view the ship under tug power as she made her way down Boston’s Inner Harbor to Fort Independence at Castle Island. Once at the fort, Constitution delivered a 21-gun salute to the Nation; responding salutes were delivered by the Concord Battery and the 101st Field Artillery, Massachusetts National Guard. November 3, 2017, was USS Constitution‘s change-of-command. 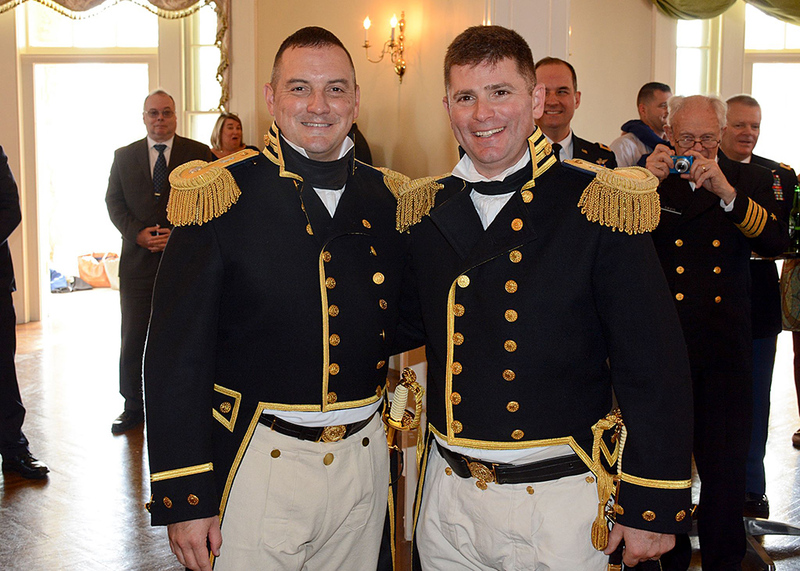 CDR Robert S. Gerosa, Jr., who oversaw “Old Ironsides’” first 21st-century dry docking, departed for a new duty station, and CDR Nathaniel R. Shick was installed as the 75th in command. With her new captain, “Old Ironsides” begins a new year, 2018. Continuing work on the ship by the NHHC Detachment Boston ship restorers and riggers will include several new gun deck beams and final up-rigging which will bring back her lofty profile. We will continue to bring you stories of USS Constitution‘s progress into the summer of 2018.